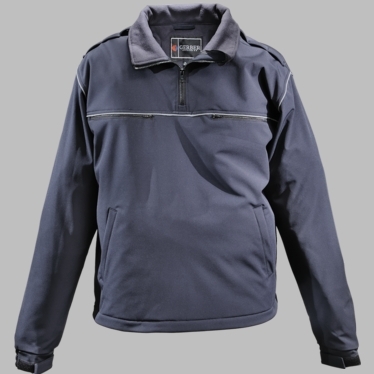 Waterproof Breathable Widproof Soft Shell Quarter Zip Job Shirt. Classic styling with durable high performance fade resistant outer shell. Oversized set in hand warmer pockets, zippered set in chest pockets, adjustable cuffs, Scotchlite reflective piping, elasticized draw cord back waistband with adjustable barrel clips and segmented mic strips on the shoulders.